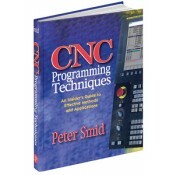 Written by the author of the bestselling CNC Programming Handbook and Fanuc CNC Custom Macros, CNC Programming Techniques is a practical and very useful resource. It covers central CNC subjects, including how to program cams and tapered end mills. This is hard-to-find information delivered by Peter Smid, one of the most prolific and celebrated CNC experts. More common topics, such as cutter radius offset and thread milling are covered in great depth in the hardcover volume's 448 pages. See the Table of Contents to appreciate the depth of coverage. • Presents detailed part programming suggestions for a variety of machining operations. • Includes discussions on the following major subjects: thread milling methods, knurling, programming cams, part reversal methods, using pallet changers, applying special grooving and threading techniques, and many more. • Provides numerous illustrations, charts, tables, and practical examples, allowing users to fully understand all concepts. • Many methods presented can also be adapted to programming methods using a CAM system.